DOT crews were out installing preliminary markings on 26th Street today. The first crosstown protected bike lanes in Midtown are starting to take shape. DOT crews were spotted by Jeff Novich putting down preliminary markings for a parking-protected bike lane on 26th Street this morning. The project only requires striping and paint, so a rideable bike lane shouldn’t be far behind. Until now, crosstown routes have been a missing link in the Manhattan bike network. Last June, charter bus drivers struck and killed Dan Hanegby and Michael Mamoukakis on West 26th Street and West 29th Street, respectively, within the span of a few days. Afterward, CB 4, Transportation Alternatives, and City Council Transportation Chair Ydanis Rodriguez called for protected bike lanes to make crosstown cycling safer. NYC DOT unveiled its plan for 26th Street and 29th Street in January [PDF]. 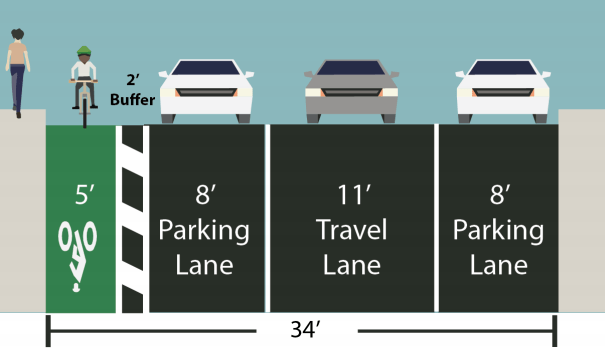 The design calls for a five-foot bike lane separated from the parking lane by a two-foot buffer. Later this year, DOT reps will show plans for two more pairs of crosstown protected lanes: one on 52nd Street and 55th Street, and another on a to-be-determined pair of streets through the Times Square area. The agency is also planning a two-way protected bike lane for 13th Street ahead of the L train shutdown. Congrats to the advocates that made this happen, but I gotta say, just thinking of a seven-foot right-of-way makes me claustrophobic! This is good news, I think. It never hurts to have more options. I personally like going east on West 24th Street because of the extra width. Thank you all who made it happen. I understand and prefer left side bike lanes on one-way streets. What is the advantage of right side PBL here and other places like Grand street downtown? The lane on 29th is on the left. I think 26th is on the right because of the two-way section between 2nd and 1st. I actually switched from 30th to 26th when they announced the lanes in the winter despite it being further out of my way. 26th feels safer even without the bike lane, as traffic seems lighter and less impatient and the light timing more favorable. The one major issue I have found is that you approach 1st Ave from 2nd with a green light and almost all bikes will want to go left onto the 1st Ave bike lane. You need to watch for the occasional car coming at you from the FDR/Bellevue service road (most traffic seems to turn right onto 1st, which makes it even more unexpected) as well as drivers behind you who want to go left into the 1st Ave traffic lanes. But anyway, should make cycling across midtown an option for many who never would have considered it. i’m not going to miss dodging the trucks, construction, and plants (yes, we have a jungle in manhattan) on 28th between 6th and 7th. This is so awesome — my gig is moving to Chelsea and this is going to improve my commute a thousandfold. Thanks and congratulations to everyone who made this happen. Am I mistaken, or will this be the first street in NYC not designed with a “secret” double parking space? It’s pretty hard to double-park on some parts of Grand Street without blocking all through traffic. I love those plants, but agreed. 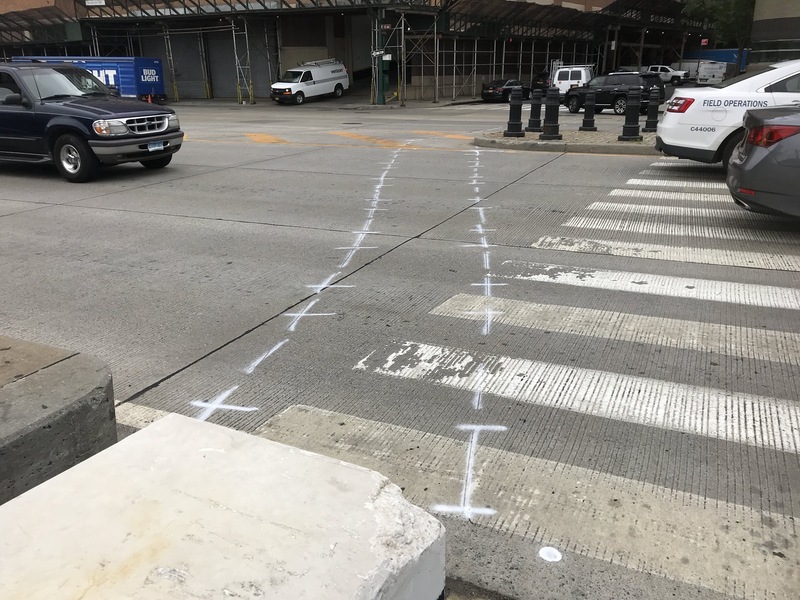 This is excellent news–crosstown PBLs ought to feel even safer than avenues with their less-frequent intersections, but is DOT still doing the bulldozing-zone intersection treatment? Manhattan Community Board 5 endorsed DOT's plan for crosstown protected bike lanes on 26th Street and 29th Street last night by a vote of 30 to 6. DOT has said installation will likely begin in "late spring." More protection for cyclists — but no objection from an enlightened Manhattan community board.